And We Are Doing It! Kan Danmark gå forrest i en bæredygtig omstilling? This book asks a good question: what can we do about the fact that we live in an unacceptably unjust and hopelessly unsustainable world? It’s such a huge question that few, if any, other writers have tackled it head on, which is what this book does. The author’s most challenging view is that the necessary transformation cannot happen unless we establish a new international framework designed to regulate intergovernmental relations in a Gaian world order. This is envisaged as a world of many self-determining, cooperating small sovereign states under a common umbrella of protection of the environment. States […] would delegate a degree of sovereignty to a global governance body responsible for ensuring long term sustainability of the planet and the observance of human rights in all members states. This should be the long term goal. In the meantime what we can do is to design the institutions that would allow such a Gaian world order to evolve. This is an important book, a tough read perhaps, some of which you may or may not agree with, but a clearly thought out and well written analysis of the extremely grave state we are in and some clear proposals about what could and should be done to change the system as a whole. Most commentators, having described the current situation and what needs to be done about it, throw up their hands and say: what’s missing is the political will. That leads to campaigns to persuade governments to act. The end result is that the trends continue inexorably. Jackson, by contrast, says: humanity has a problem, let’s analyse it, decide on a plan and then implement it. There are enough Cultural Creatives in the world to make it happen. It’s a response one can only admire. As the author writes in the Afterword, “A bold initiative is necessary to shake up the logjam that is preventing global solutions from emerging in our contemporary world”. This book proposes such an initiative and ends with an invitation to readers to join it via the website he has set up for the purpose www.occupyworldstreet.org. – Dr. Garry Herbertson, Præsident, Earth Day International. – Dr. Shantilal K. Somaiya, Chairman, Somaiya’s Education Trust, Mumbai. 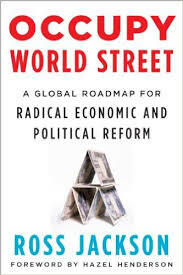 Occupy World Street is a starburst of enlightenment and a practical vision of hope for a new and advanced society. Rashmi Mayur, Ph.D., director of the International Institute for Sustainable Development, Bombay, India. - Duane Elgin, author of The Living Universe. Karsten Just, lektørudtalelse fra indbindingscentralen. – David C. Korten, forfatter til “When Corporations Rule the World”. - Clinton Callahan, author of Directing The Power of Conscious Feelings. – Helena Norberg-Hodge, forfatter til Ladakh: da vesten kom til Himalaya. – Knud P.Pedersen, Nordisk Netværk. “Occupy World Street is a profound and urgently needed roadmap for the future of human civilization”. - Will Keepin, author of Divine Duality. - Maurice Strong, Secretary-General of the UN Earth Summit, Rio 1992. – Dr. William Symes, tidligere præsident for Monsanto Foundation. Which Will Be the First Nation to Act?